I’ve been doing a little research on the history of the lines in the area around Nice. The first rails were planned alongside the River Var in 1845. At that time Nice and its surroundings were part of the kingdom of Piedmont-Sardinia. The rails were laid on a 12 kilometre length between La Rochette Sur Var and Aspremont. The line began working with a single flat wagon drawn by a mule. In 1860, Nice was annexed by France. This annexation created various upheavals. Amongst the changes was the generation of a new railway line from Marseilles to Nice which did not pass through major centres of population in the Var – Brignoles, Draguignan and Grasse. Local dignitaries began a process to develop a central line through the Var. This process wass given some impetus when on January 24th, 1872, a collapse between Antibes and Cagnes highlighted the brittleness of the single railway link. The recent annexation of Nice generated a desire for a direct line to Paris. The valley of the Var was considered for this route even though there is no road in the valley. Puget-Théniers was connected to the coast only by one mule track. Single track lines were proposed of standard gauge. Nice’s officials were unhappy and proposed a million franc subsidy to ensure that Nice was included on the main routes of the system – to Digne and the ‘Central Var’. Work commenced on two lines: in 1881: Digne to Castellane; and in 1882: Grasse to Draguignan. The original intention was to use standard gauge but the costs of standard gauge became prohibitive. Initially thought to be in the region of 200,000 francs per kilometre rose to a likely, 300,000 francs/km for Digne-Castellane and even 600,000 francs for Draguignan-Grasse. The decision was made in 1883 and 1884 to redesign the lines to a metre gauge, the routes became more sinous and less expensive and a new railway company was formed – La Compagnie des Chemins de Fer du Sud de la France – to run the concessions. Work on the Central Var line started, along its full length in 1886 and 1887. For the first time in France, a narrow gauge line attained a length greater than 100 km. 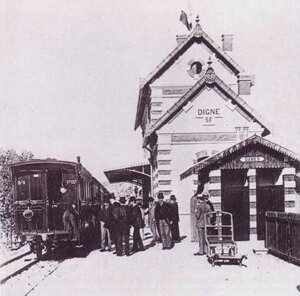 The first section Draguignan-Salernes was officially opened on April 23rd, 1888. On August 27th, the line reached Barjols, and then on January 28th, 1889 the terminus of Meyrargues. 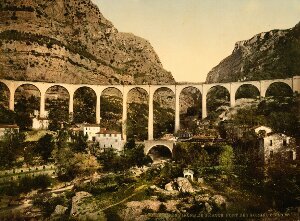 The building of the section from Draguignan to Grasse, faced greater geological obstacles and required the building of remarkable civil engineering structures, like the viaduct of Siagne (a metallic bridge of 72 metres high) and the viaduct of Rayol. For a time there was great tension between France and Italy and the standard gauage coastal line was thought to be under threat. An alternative standard gauge route was prosed by putting a third rail alongside the metre gauge line between Nice and Draguignan. The decision was also taken to construct a coastal line to link towns not served by the standard gauge. The first section St-Raphaël-St-Tropez was inaugurated on August 25th, 1889, then the line was extended to Hyères August 4th, 1890. On the July 1st, 1894, a branchline Cogolin-St-Tropez was opened. The unveiling of the last length of main line, Hyères-Toulon was opened on August 6th 1905. 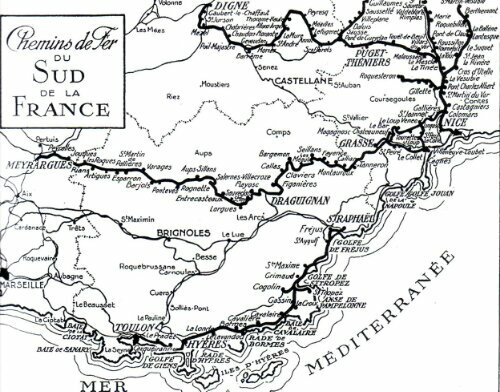 By 1892, La Compagnie des Chemins de Fer du Sud de la France had a 300km network with over 135km in difficult terrain, crossing the boundaries of four departments. The map shows the full extent of the network which was finally completed in 1911 when the Digne to Nice line finally was fully opened. By then the network had 349km of lines. Sadly, the only line left now is that from Nice to Digne. This entry was posted in Railways and Tramways Around Nice, Railways Blog on December 12, 2013 by rogerfarnworth.